Can we turn one of the most-loved cocktails, the Mojito, into a dinner? Yes – and it’s delicious! There are 4 key flavors to the Mojito: lime, mint, sugar, and rum. We use all but the rum, however feel free to pour yourself a glass while you cook. In fact, the recipe will be finished cooking by the time you finish that drink. 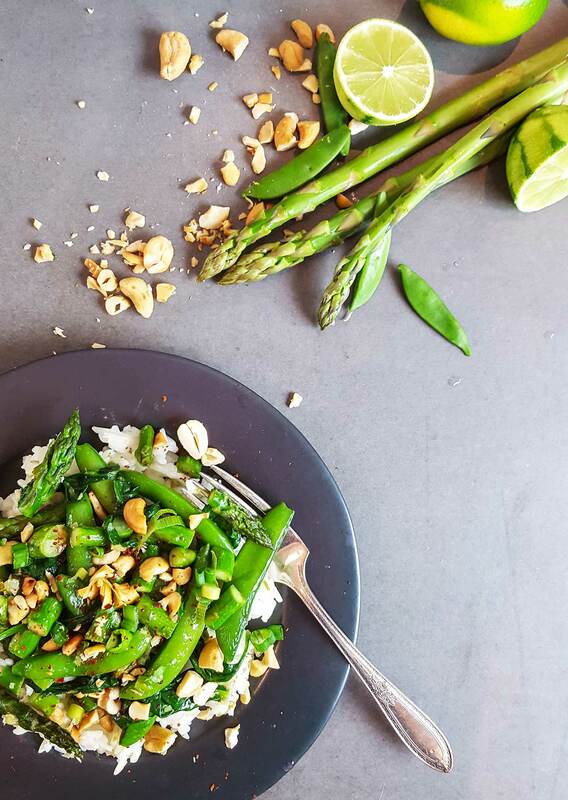 First, we start with a bed of lime rice, then add sweet vegetables (asparagus and sugar snap peas). That all gets topped with mint and more lime juice. Since every good cocktail tastes better alongside some bar nuts… we throw toasted cashews on top as well. And there you have it – a Wednesday night dinner inspired by a cocktail. Cheers! A stir fry inspired by a favorite cocktail, featuring lime rice, sweet vegetables, and mint. Add rice and cook according to directions, usually bringing it to a boil, then simmer for 15-20 minutes. If it finishes before your vegetables, just keep it covered and it will stay warm. Heat your largest stir fry pan over medium heat and add the cashews. Toast for 2 minutes, or until they smell fragrant. Take them out and set aside. Prep the vegetables: slice the green onions and grate the ginger on a zester or finely chop to save time. (4 min). Zest the last lime and cut it in half. Heat your now-empty stir fry pan over medium heat and add the oil. Add ginger and green onions to the pan and sautee for 2 minutes, until fragrant. Add the asparagus and snap peas, cooking for 2-4 minutes, until they are just slightly cooked but still snappy. Add the honey, soy sauce, red pepper flakes, lime zest, lime juice, and 1/4 tsp salt to the pan. Cook for another 2 minutes. Remove from heat. Your rice should just about be done. Cashews: you could sub in peanuts. I prefer salted nuts for this dish, you know, like bar snacks! While calories aren’t a perfect measure, they are definitely helpful to keep portions in check. Otherwise I’d eat 2 cups of rice just for myself! The picture above breaks down the calories for each ingredient on a per-serving basis. And I also included the values for iron since this recipe account for 40% of your daily value. You can see a lot of it come from the cashews, asparagus and snap peas. Save time: this recipe comes together quickly, but if you want to shave about 8 minutes off if you use ginger that’s already minced and fresh shelled peas. Nuts: you can use almost any nut, really. Peanuts and almonds would also work quite well. 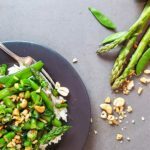 Measurements: don’t worry about how much asparagus, snap peas, or spinach you use – the recipe can accommodate as much or as little as you want without having to adjust the seasonings. This is adapted from the cookbook, A Modern Way to Eat. I was reading the original recipe, “Asparagus and toasted cashew stir fry,” and decided I wanted to make it for dinner. But while reading it, I saw she added lime at the end of the dish, along with mint (or cilantro, your choice). I decided to amp up the lime by making lime rice and swapping out maple syrup for the honey. After working through the recipe, it hit me: these are mojito flavors. This book was on to something! I have book marked several of her other recipes. At the top of my ‘make it now!’ list are strawberry elderflower sherbert, mint-pistachio zucchini meatballs, and farro with roasted leeks.